Looking to book a Tipperary Stag Party, Stag and Hen Weekends offer fun packed value for money packages in Tipperary, simply contact us by e-mail or phone, tell us what you want, we will check for hotel / activity availability and get back to you with a price for your fun filled Tipperary Stag Night or Tipperary Stag Weekend. 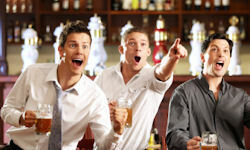 We will work with you so that when the stag party is over, it will be talked about for many years to come. We have been working with accommodation providers, activity providers and many other professionals for many years and we have delivered all our grooms safely to the altar on time.